The Tour de France (often referred to as the Tour) is the biggest bike race in the world and the biggest annual sporting event on the planet. This is the race even non-cyclists know about and have a vague idea of – pretty much like Wimbledon is for tennis. The best teams and riders are all here in peak fitness so not only the ultimate race to win but merely taking part in shows how good you are. What are the main things to understand? It takes much less energy to ride in a group than it does to ride on your own or in a small group of 3 or 4. This is due to aerodynamics and wind resistance. This is why breakaways rarely succeed (where one rider or a handful or riders split off in front of the main bunch and try to get away). It’s this ‘working together in a pack’ that gives cycling its tactics and variables. For the majority of stages all the riders will ride along in one big bunch (called the ‘peloton’). Every now and then along the route there are checkpoints – sort of mini-finish lines – where riders who go across the line first score points. These checkpoints are either at the top of climbs (earning climbing points) or on flatter, faster sections (earning sprinting points). The ‘peleton procession’ racing changes in the mountain stages where the aerodynamic advantage of riding in a pack prewtty much disappears. This leaves a handful of climbing specialist riders to duke it out at the front. The mountain stages are generally regarded as the most interesting stages to watch. The race is three weeks long and starts in Holland on Saturday 4th July (the Tour often starts outside of France) and makes its way round France in an anti-clockwise direction before finishing in Paris on Sunday 26th July. This year’s race covers a total of 3,360kms (2,100 miles) over 21 stages. The riders have two rest days during the race on the second Monday and third Tuesday. No, the shortest is the first stage which is a 13.7kms individual time trial against the clock. The shortest ‘proper’ road stage is stage 21 which is 107kms. The longest road stage is stage 4 which is 221kms long. The rest are of varying distances with slightly shorter days in the mountains. Riders must ride and finish all stages. The overall winner will be the person who covers each stage in the lowest aggregate time. Is there a women’s Tour de France? No but there is a one day race for professional women on the Champs-Élysées in Paris on Sunday 26th July before the men’s race arrives. 2015 is the 102nd edition of the race. The race was first run in 1903 and has been run annually ever since apart from during the first and second World Wars. What are the jerseys all about? There are several classifications for riders to battle for, each with their own unique jersey. 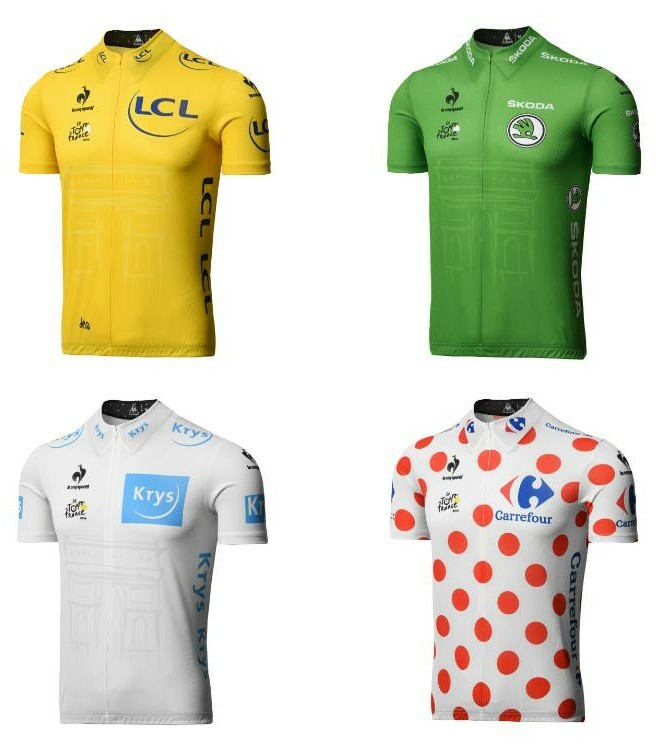 The jerseys are worn throughout the duration of the Tour by whoever is the current leader in that category. So whoever is riding in the Yellow jersey is the current overall leader, for example. Green Jersey (Sprinter’s jersey) – the rider with the most sprinting points. Polka Dot Jersey (King of the Mountains climber’s jersey) – the rider with the most climbing points. White Jersey – (Best young rider’s jersey) the fastest under-26-year-old on overall aggregate time. Is Wiggo riding this year? No, Sir Bradley Wiggins (who won the race in 2012) will not be taking part this year as he has retired from top level road cycling. Are there any Brits racing? This year there will be 10 Brits taking part, the most since 1955. Which are the best stages to watch? The short individual time trial could put British national time trial champion Alex Dowsett into the yellow jersey. The longest stage of the race but more importantly includes seven cobbled sections. Expect to see spectacular images and riders losing time. Let’s just hope there are no injuries or withdrawals like last year on the cobbles. All of the above stages in the hihgh mountain of the Pyrenees. All of the stages in the Alps from stage 17 onwards should be exciting but this one is special. The penultimate stage to Alp d’Huez looking a belter as it’s the last chance for the favourites to attack for time before the race ends. There are four main contenders to win the race overall. Winner in 2013 and has just won the warm up race for the Tour (Criterium Dauphine) so is in good condition. Multiple previous winner and considered the best stage race rider of this generation due to winning the other Grand Tours multiple times. Won this year’s Tour of Italy in May so in good form but has he done too much already? Runner up in 2013 and won the Tour of Italy in 2014. Hasn’t raced much this year but has done all the correct build up and will be a force in the mountains. Tagged beginner, le tour, pro cycling, racing, tdf, Tour De France. Bookmark the permalink.